Passers-by at a void deck in Telok Blangah looked on at the curious sight in front of them. A production line had formed there on this weekend morning. People were packing things into bags, then passing on the bags to the next person. The group of people was actually a very thoughtful bunch of young adults from Heart of God Church! Having heard about the other #loveothers14 initiatives, they decided to do something and make a difference in the heartlands too. More than 40 of them gathered together to pack and distribute bags filled with daily necessities such as rice, biscuits and toothpaste. They also attached encouraging notes onto these bags, making sure that there were English and Chinese messages so that the elderly Chinese-speaking residents could read them too. 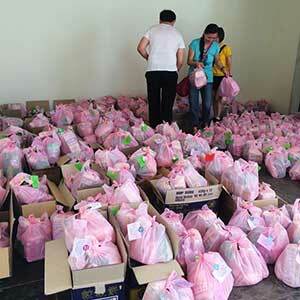 That day, 320 households in four Telok Blangah blocks received these welfare packs! Many of the residents were very surprised, and thanked the group enthusiastically.